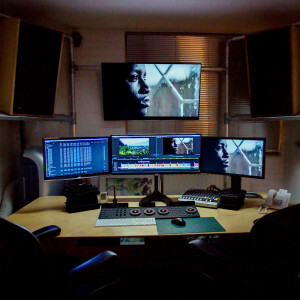 We built this suite to be a cost-effective alternative to Soho editing and grading. We aim to provide a pleasant working environment – there’s client seating behind the editor and large screens so the editor can work and the client can relax without getting in each other’s way. It’s capable of being totally blacked out for grading, but you can also have daylight and fresh air which you may appreciate on longer projects, a nice change to Soho basements! The two main monitors are both 4K and the NEC is calibrated for grading work, giving you a detailed and accurate view of your film. The audio playback system is unusually high spec, enable you to hear exactly what’s going on even at relatively low volumes. The 32 TB raided drive provides plenty of storage for your production. We have a range of up-to-date software for both grading and editing, including the latest Avid Media Composer, Adobe Creative Cloud, DaVinci Resolve Studio 12 and Final Cut X, so we can accommodate most productions. We offer legalising services using Eyehight Premiere Pro legalising plugin to get your video ready for broadcasting.